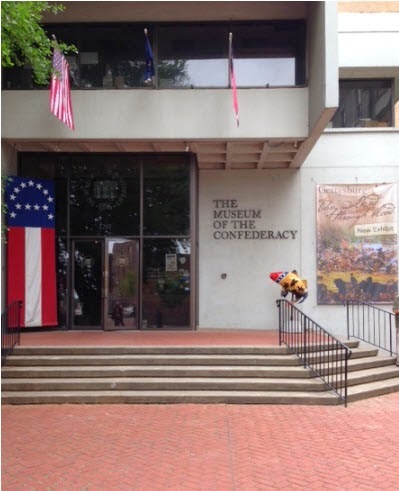 When I was in Richmond, Virginia, a few weeks ago, I visited the Museum of the Confederacy (http://www.moc.org). Whether your ancestors were from the North or the South in the Civil War (or both like mine), this museum is well worth the trip. 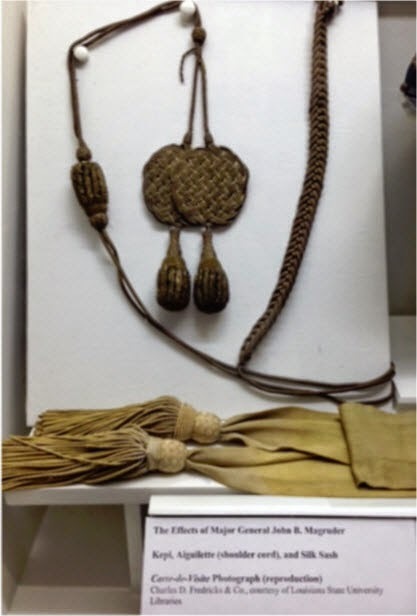 Inside you will find flags, maps, guns, rifles, swords, cannons, uniforms, hats, boots, drums, bugles, saddles, letters, photographs, dolls used to smuggle medicine, ribbons, bibles, pocket watches, cookware, pipes and so much more. I am not very knowledgeable about military history, but this museum will entice even the novice. 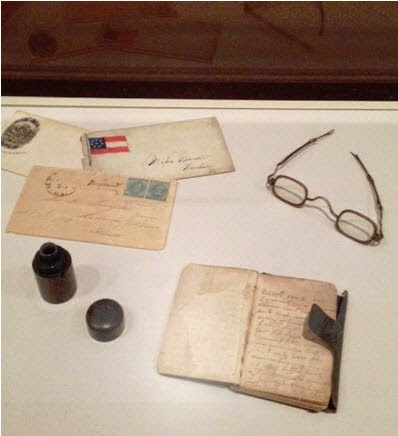 I was really impressed with the number of letters, bibles and documents containing genealogical information. I, of course, started researching John Bankhead Magruder. Ironically, despite his fame, there apparently is a disagreement about his date and location of birth. Several sources, including many public trees on Ancestry.com, list it as May 1, 1807 in Port Royal, Caroline County, Virginia. (2 and 3) One record on Ancestry.com actually has him born in 1807 AND on August 15, 1810. (4) I made a comment on Ancestry.com about that problem. Other sources say he was born 15 Aug 1810 in Winchester, Virginia. (5) At least one source states that Magruder was born in 1807 in Winchester, Virginia. (6). If people have this much trouble pinning down the vitals on a famous person, how are we ever to track down the every-day, run of the mill ancestor? There are numerous books and articles, favorable and unfavorable, on Magruder. Many libraries and universities have manuscripts, dissertations and letters concerning Magruder, including the Swem Library at the College of William and Mary. (10) I could easily spend all my time researching his life. But there are many ancestors waiting for my attention. (1) Konstam, Angus. Seven Days Battles 1862: Lee's Defense of Richmond, p. 20. Botley, Oxford, United Kingdom: Osprey Publishing Ltd., 2004, Google Books (http://books.google.com: accessed 31 May 2014). (2) Find A Grave, Inc., Find A Grave, digital image (http://www.findagrave.com: accessed May 29, 2014), John Bankhead Magruder, Old City Cemetery, Galveston, Galveston County, Texas, Memorial No. 11021. (4) Entry for John Bankhead Magruder, “American Civil War General Officers” database on Ancestry.com (www.ancestry.com: accessed 31 May 2014), Ancestry.com Operations Inc., Provo, UT, 1999; Original data compiled by Historical Data Systems of Kingston, MA, Copyright 1997-2000. (5) Wilson, James Grant, and John Fiske. Appleton's Cyclopaedia of American Biography, Vol. IV. New York: D. Appleton and Company, 1888, p. 175 (http://books.google.com: accessed 31 May 2014). (6) Op cit., Seven Days Battles 1862: Lee's Defense of Richmond, p. 20. (7) Settles, Thomas M., Preface," In John Bankhead Magruder: A Military Reappraisal, pp. 2 and 5. Louisiana: Louisiana State University Press, 2009, Google Books (http://books.google.com: accessed 31 May 2014). (8) Op cit., Find A Grave. (9) “Are Pardoned Confederates Still Confederates?” Posted in Leadership Memory by Andy Hall on November 5, 2010, Dead Confederatres, A Civil War Era Blog (www.deadconfederates.com: accessed 31 May 2014). (10) Op. cit., John Bankhead Magruder: A Military Reappraisal, Bibliography.